Metal spinning is just one of many metalworking processes used to create specially shaped metal products, but it is chosen above other processes because of its capacity for producing very high quality metal shapes. Aluminum Spinning – Acme Metal Spinning Inc.
Metal spinning produces axially symmetric, round metal shapes that are used in many ways in all kinds of contexts. 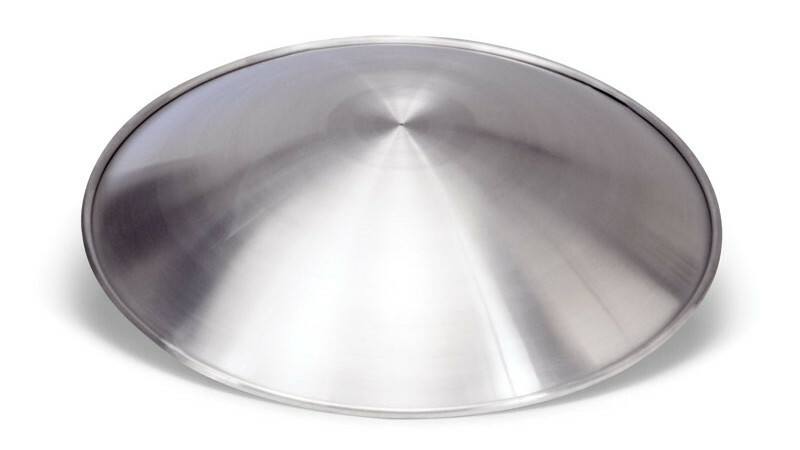 Just a few spun metal products include rocket nose cones, bowls, architectural lighting components, ash trays, bird baths, furniture, waste receptacles and decorations like candle holders and trophies. Aluminum in particular is valued because of its strength and durability as well as its clean, shiny appearance. Also, because metal spinning is a cold working process, spun aluminum products are usually particularly strong, especially compared to products of hot working processes. Although aluminum metal spinning can be controlled by hand, computer numerical controlled metal spinners are more commonly used; CNC machines can produce very precise and defect-free products much more quickly than can manual metal spinner operators. CNC machines also ensure quality and consistency from part to part. When the forming of the part is controlled by hand, it can be a physically demanding process, requiring a great deal of practice. Metal spinning is a fairly simple process on a conceptual level. It is a cold working process, which means that the metal shaping takes place at or near room temperature. Many other metalworking processes are performed at very high temperatures. Metals become easier to shape at very high temperatures, but the increased risk of oxidation and other undesirable consequences make hot working impractical in the formation of some kinds of metal products. Metal spinning involves a lathe, shaping tools and the metal material for spinning. This material is called a blank, and it is usually a flat round disc made of aluminum, copper, stainless steel or another metal. The blank is attached to the lathe, which spins around at high speeds in order to expose the entire blank to the shaping tools. The shaping tools then apply pressure in the appropriate places, shaping the metal as it spins. This pressure can be applied by a single tool or by multiple levers hydraulically. The finished aluminum product, if produced correctly, should have no wrinkling or warble due to the high speed of rotation on the lathe. The process is cost-effective and quick, with the average aluminum piece only requiring about five to ten minutes to complete. Aluminum Spinning Aluminum spinning is a metalworking process in which a flattened disk of aluminum is spun around by a lathe and given shape with a number of tools.